Fleming and his captain, Chris Conklin, have been planning this exciting voyage for the past 18-months, eventually setting out from Southampton in the UK on April 19th. During the next two months, VENTURE II cruised parts of England and Ireland before exploring the Western Isles of Scotland. She arrived in Torshhavn in the Faroe Islands on June 13th, where Fleming and his crew spent five days traveling throughout the fascinating island group located halfway between Scotland and Iceland. Yachts to his next generation of management, he has been able to focus on cruising to faraway destinations while producing high quality videos of each of his voyages. Another important reason for Fleming’s voyages is to provide first hand feedback to the factory building new Fleming 55s, 65s and 75s in Taiwan. VENTURE and VENTURE II, both Fleming 65s, have been used to test new systems and equipment before they are incorporated into production models. Recent examples include the Seatorque enclosed shaft system, Hypro Marine’s Fly-by-Wire steering system and BÃ¶ning’s ship monitoring system, all of which are now available on new production boats. The 400-mile, 46-hour passage from the Faroes to Iceland’s Vestmannaeyjar was an uncomfortable one, as the sea conditions severely deteriorated during the last 18- hours. Winds of 30-knots or more were off the port bow creating 8 to 10-foot square-shaped head seas on top of the large ocean swell. The Fleming 65 displaces 133,500 pounds (60,555 kg) and is powered by twin MAN 800-hp diesel engines. 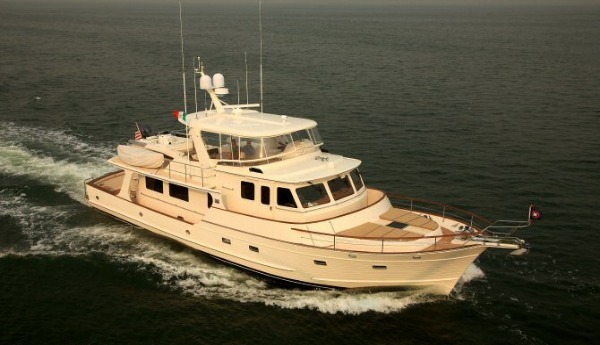 She can cruise at 17 to 18-knots, but for long passages she normally runs between 8.5 and 10-knots. With her standard fuel capacity of 1700 gallons (6,435 litres) she has a range of 1500 nautical miles at the lower speeds.